Visitor center hours: Daily 9 a.m. - 4:30 p.m. When Las Vegans are tired of being dry as a bone, they head to the Nevada-Arizona border for Lake Mead. Nearly 1.5 million acres of land encompassing both Lake Mead and the connected Lake Mohave are protected by what is the oldest National Recreation Area in the United States. As the closest major lake to Las Vegas, it’s no wonder that nearly 8 million visitors come to the park every year. Lake Mead NRA was first established as the Boulder Dam Recreation Area in 1936 after the completion of the Hoover Dam (then called Boulder Dam). This damming of the Colorado River formed the 115-mile Lake Mead, and later in 1953, the Davis Dam was constructed to create the 67 mile Lake Mohave. Both dams and reservoirs were constructed to provide hydroelectric power and water to Arizona, Nevada and California. In 1964, the two lakes and the nine surrounding wilderness areas were designated the Lake Mead National Recreation area and placed under the care of the National Parks Service. The location marks the meeting point of the Mojave Desert, the Great Basin Desert and the Sonoran Desert, providing a unique variety of ecosystems. This desert landscape coupled with an array of park and lake amenities has made Lake Mead a popular attraction. The majority of visitors are water sportsmen (and women) who navigate the 450-foot deep lake basins and beautifully sculpted narrows in motor boats, jet skis or even houseboats. The waters are also great for solo paddlers to explore the serene coves and 500 miles of shoreline in kayaks and canoes. 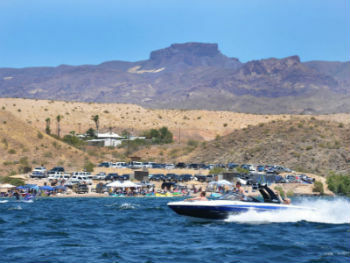 Boaters who plan to captain personal watercraft on Lakes Mead and Mohave may launch them at the designated marinas at Boulder Basin (Lake Mead Marina, Las Vegas Boat Harbor and Callville Bay Resort), East Lake Mead (Temple Bar Marina), Overton Arm (Echo Bay Resort Marina) and Lake Mohave (Lake Mohave Resort, Cottonwood Cove Resort and Willow Beach Marina). The entry fee per vessel is $16 for up to 7 days, and $30 for a yearly pass. All motorized boats must be licensed (this excludes sailboats, kayaks and canoes.) Motor boats, jet skis, pontoon boats and houseboats that hold up to 12 are available for rent at most of the marinas (usually at a two hour minimum). For a unique tour of the Hoover Dam and Black Canyon, visit The Willow Springs Marina, the "gateway to Lake Mohave," and sign up for a motorized rafting tour that launches below Hoover Dam and ends at Willow Beach. 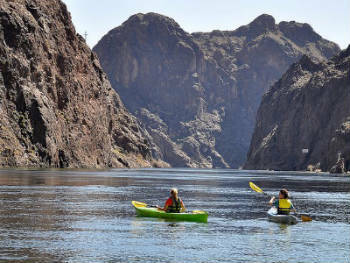 You will get a rarely seen view of the massive dam and explore the surrounding Black Canyon ecosystem, including a dip in the natural thermal springs. Rent a kayak or canoe at Willow Beach Marina, then take a shuttle up to the dam and navigate your way back to Willow Beach. Permits are required to launch personal paddle craft below Hoover Dam. Hopeful anglers can bait their hooks to lure the coveted largemouth and striped bass, which can weigh in at up to 40 pounds. A variety of other fish are fair game with a standard fishing license, including carp, channel catfish and bluegill. Fishing licensing gets a bit tricky because the lakes are divided by the Arizona/Nevada state line; you will need a license from either state and a use stamp from the other. A trout stamp is required for trout fishing. Those preferring to stay on dry land also have plenty of activities to choose from. Hikers can explore the eastern Mojave Desert ecosystem, which comprises 87% of the park, and observe some of the 900 plant species and 500 animal species that inhabit the area. At first glance, desert plant life may seem sparse and unremarkable, with the exception of the months of spring when the desert flowers bloom. But considering the conditions that these valiant plants survive, (temperatures as high as 120 degrees and a scant 6 inches of annual rainfall) you might begin to view them as fascinating natural miracles. Animals take shelter from the midday sun by scurrying under bushes and lingering wherever they can find shade, so don’t plan on seeing much animal life until dusk or in the dawning hours. 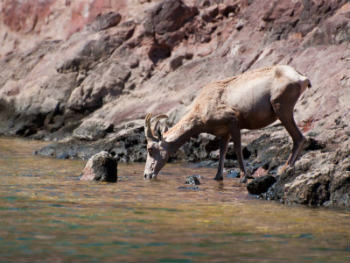 However, Desert Bighorn Sheep, Nevada’s state animal, love to roam the rocky hills around Lake Mead throughout the day. While these species have adapted to high desert temperatures and very little precipitation, keep in mind that the human species has not. Remember to drink plenty of water, wear a hat and sunscreen and watch for signs of heat exhaustion among your mates. Extreme hikers and bikers can find challenging trails in the 185,000 acres of backcountry of the nine protected wilderness areas of the Lake Mead NRA. The most popular maintained trail is the Historic Railroad Trail, an easier hike that waves through old railroad caves. Stay on protected trails marked with yellow signs reminding visitors that the area can be explored by "human power only," a rule that helps to preserve the natural biological habitats. More leisurely cyclists can spend the day pedaling away with friends on the considerably less strenuous River Mountain Loop Trail. The 35-mile paved loop circles River Mountain and connects Lake Mead National Recreation Area, Hoover Dam, Boulder City, Henderson and the rest of the Las Vegas Valley. Most of the trail offers three paths: one for casual cyclists and hikers, another for serious mountain bikers and an equestrian trail for horseback riders. The Lake Mead NRA portion of the loop runs closely alongside of Lakeshore Road from the Visitors Center to the Equestrian Trailhead and offers spectacular views of the crystal blue Lake Mead. Lake Mead NRA is perfect for day trips out of Las Vegas, but if you decide to stay overnight within the park, camping and houseboat rentals are available year-round. 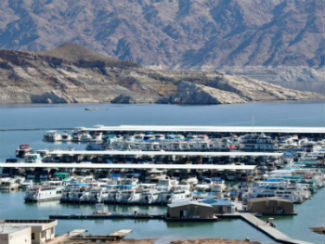 Grocery shopping is available in nearby Boulder City, and snack bars and restaurants are available at most of the marinas. Lake Mead NRA is open year-round, 24 hours, 7 days a week. Some beaches and other areas are day-use and accessible only from dawn until dusk. The Lake Mead Visitor Center is open from 8:30 a.m. to 4:30 p.m. every day except Thanksgiving, Christmas and New Year’s Day. Entrance passes for Lake Mead recreation area are sold for a one- to seven-day period, or as an annual pass. Fees are set by vehicle or motorcycle, vessel (boats) or individuals (hikers, cyclists, etc.) Lake Mead NRA is accessible with a Senior Federal Lands Pass, Access Federal Lands Pass and the Federal Interagency pass.